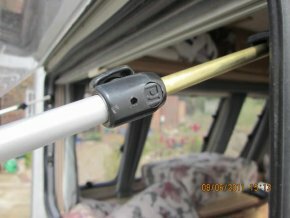 Often through general wear and tear the plastic struts inside your caravan window will break. You could go out and buy an entirely new stay but it’s quite easy to repair just the struts. Image 1 shows what a broken strut looks like. A broken strut. It has come away from the plastic knob of the stay. To replace the strut you will need some 9mm or 3/8” tube. This could be plastic but metal will be stronger, especially on larger windows. 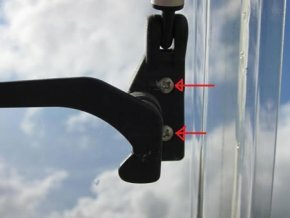 Firstly, unscrew the strut from the window frame. The red arrows show which screws you should undo. There may be some of the broken strut still left in the aluminium tube. Looking at the clamp near the handle you should see a small roll-pin. You need to lever this out using a screwdriver and a bit of WD40. The green arrow shows the roll-pin you need to lever out. It should now be easy to shake the bit of strut out, though try to keep it as you’ll need it later. The broken struts – keep them safe for later. Position the roll-pin previously removed from the clamp over the roll-pin in the hinge. Tap down on it using a light hammer, ensuring the exit hole is positioned at the edge of a solid work surface. If you don’t have the roll-pin from the clamp you can use something else approximately 3mm in diameter. 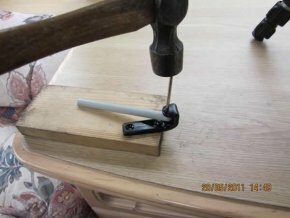 Position the hinge near the edge of a solid surface, and use a light hammer to drive out the roll-pin. You can now cut your tube to the same size as your previous strut. 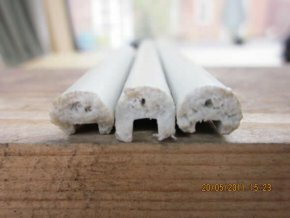 You could use a hacksaw but this will require you to clean up the edge whereas pipe cutters will give a better cut first time. Now drill a 3.5mm hole into your strut, centred at 5mm from the end. It’s a good idea to file flat the area you’re going to drill and to use a bench drill to keep the bit on point. If you use a vice to hold the strut you should pad the jaws to prevent any damage. 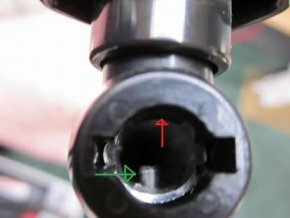 If you mark or crush the strut it may not slide properly into the tube. Taking the hinge roll-pin, push it halfway into the hole in the new strut. Check that the end of the strut moves freely in the hinge. If it does push the roll-pin all the way in. If not, remove the roll-pin and file down the strut. You can now slide the strut into the tube and check that it moves smoothly. You may need to clean inside the tube where you drilled. You can use a round file or a pencil wrapped with emery paper to give it a good finish. When the strut slides smoothly in the tube you can go ahead and refit it. The new strut finished and fitted into place. 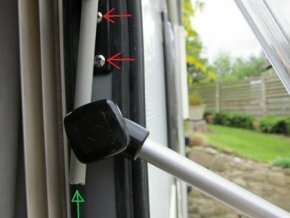 Please note; the roll-pin in the clamp prevents the caravan window from being opened too wide. When you remove this you lose the function so it will be up to you to ensure the window doesn’t open too far. Also, if using metal tubes there is the potential for corrosion should they get wet. It would be advisable to use plastic tubes if replacing a shower window.